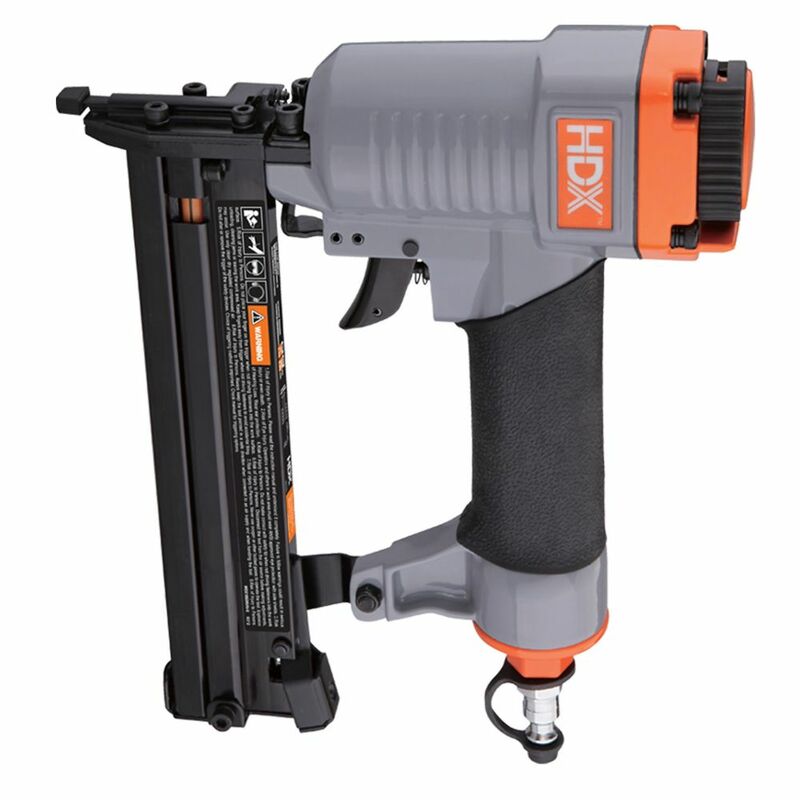 This HDX Pneumatic 18-Gauge Strip Narrow Crown Stapler can shoot crown staples ranging from 3/8 Inch to 1-1/4 Inch long. The die-cast aluminum housing allows the tool to be durable while still remaining lightweight. The comfort grip handle helps reduce fatigue during extended usage. This Narrow Crown Stapler is great for interior decorative trim, cabinetry, cabinet backing, crafts and hobbies. HDX 1 year limited warranty please call 888-669-5972 with questions. 1-1/4 Inch Narrow Crown Stapler This HDX Pneumatic 18-Gauge Strip Narrow Crown Stapler can shoot crown staples ranging from 3/8 Inch to 1-1/4 Inch long. The die-cast aluminum housing allows the tool to be durable while still remaining lightweight. The comfort grip handle helps reduce fatigue during extended usage. This Narrow Crown Stapler is great for interior decorative trim, cabinetry, cabinet backing, crafts and hobbies. 1-1/4 Inch Narrow Crown Stapler is rated 4.5 out of 5 by 10. Rated 4 out of 5 by HomeDepotCustomer from Met expectations.... Met expectations. Rated 5 out of 5 by Fan from Very pleased with this stapler. It was a little smaller... Very pleased with this stapler. It was a little smaller than I expected but it’s very strong and suited my needs for half the price. Rated 4 out of 5 by C6gs4dk from The Stapler worked as well as I expected. Performed without a jamb. Drove the staples according t... The Stapler worked as well as I expected. Performed without a jamb. Drove the staples according to the setting into oak trim. Only thing missing was a case to put it in to give it an excellent rating. Rated 5 out of 5 by HomeDepotCustomer from Worked just as expected, easy to use and fantastic value... Worked just as expected, easy to use and fantastic value for the price. I used it for some simple upholstery jobs and it was definitely up to the task. Rated 5 out of 5 by TXRemodeler from Great little stapler This stapler has performed well so far. I haven't had any problems with jamming or misfires. It's an inexpensive brand so time will tell how well it holds up but my initial impressions are very positive.